By this point many people had become familiar with merchandise from the Arita region. Continental Japanese markets had a lot to do with shaping the perception of consumers from that time. The great popularity of Arita merchandise caused Tsuboya potters to make Joyachi. Tsuboya quickly became very known throughout the ceramic-appreciating world for its intricate kiln work. Enameled ceramic embellished with colorful designs typified the style. Joyachi is generally decorated with drawings of dragons and other creatures in a variety of colors. This makes it quite attractive to collectors as well as first-time buyers. Certainly some people must have argued that potters were sacrificing their artistic integrity. Others, though, surely felt that this new style was something that was exciting and fresh. The strong colors and new intricate patterns were much different from what many of these potters were used to working with. Continental buyers found it still outstanding compared to other similar pieces that they were looking for. Okinawan ceramics always have a tendency to stand out against the crowd after all. 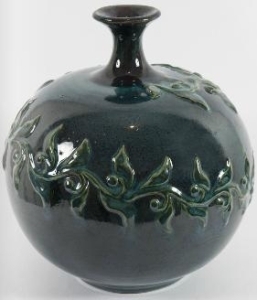 Notably the types of pieces that they were producing changed as well. Rather than the large storage jars of the past, joyachi pieces were shipped as modern vessels. They commonly come in the form of ceramic pots, plates, teapots and bowls as well as the famous vases that Okinawa is quite well known for. Nevertheless, there are plenty of examples of joyachi jars designed for holding Amawori. Many traditions adapt to new paradigms rather than float away. Works to come out of the Naha region have a gleam all of their own. It should be noted that the Japanese government annexed the Kingdom of Ryukyu in 1879 and created the Prefecture of Okinawa in its place. This drastic political change also caused the Tsuboya kilns that previously enjoyed royal support to now endure private management. This became something of a double-edged sword. Some commentators feel that the lack of royal support seriously hurt the financial prospects of potters in the area. Others, though, remark that needs were now dictated by the market as opposed to royal whims. This gave artists more leeway when it came to designing how they wanted their pieces to look. Today, of course, private management reigns supreme with most artists studying under a master to eventually succeed in their apprentice work. Formal education additionally plays a role in Okinawa’s potter community.